In stock on our floor in Wisconsin. Fly into MKE to inspect under power in all it's glory! 5’ X 10’ Precision Plasma System with Hypertherm EDGE CNC Controller, Proline 2150 Plasma Cutting System and Water Table. Aronson Welding Positioner 3,000 Lb. 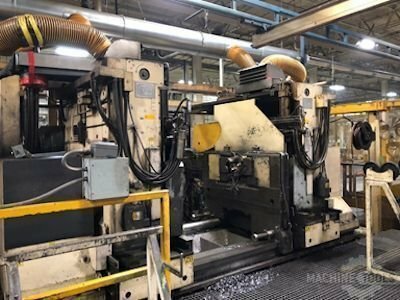 Niagara Coil Straightener 48" x 0.074"
Heckert Combination Horizontal/Vertical Mill 18" x 71"
Precision Quincy - Gas Oven | 48" x 48" x 30"
Bradbury Servo Feeder 48" x 0.048"
Mighty Viper CNC Turning Center 34.6" x 78.7"
2002 Enshu JE60S CNC HMC, 60 Tool, TSC, Full 4th, Mist, Conveyor, Ran Aluminum, Well Maintained! 6' X 13' Table Waterjet Cutting System with Burny 10 LCD Plus CNC Control, 50HP 55K PSI Flow Intensifier Style Pumps, 3-Axis Abrasive Cutting Head, 1100LB Garnet Hopper and Garnet Recovery System. This is an extremely clean compact CNC lathe. Can be inspected under power!